For years, the Colombian government expressed little interest in engaging in international transparency mechanisms for its extractives sectors. It failed to understand how revenue transparency might help strengthen these sectors’ productivity and equity, and instead relied on its own national systems to ensure transparency around extractives revenue. Colombian civil society, likewise, did not appreciate how their work could be bolstered via international mechanisms focused mainly on economic issues and not other areas of governance. Civil society’s interest changed when the Extractive Industries Transparency Initiative (EITI) expanded its purview to include information throughout the decision chain. Nevertheless, these organizations needed guidance on how to proactively engage with EITI and how to procure grants to support their participation in the initiative. Colombian civil society began its EITI engagement through regional meetings and training sessions organized by the Natural Resource Governance Institute (NRGI) and the World Bank. 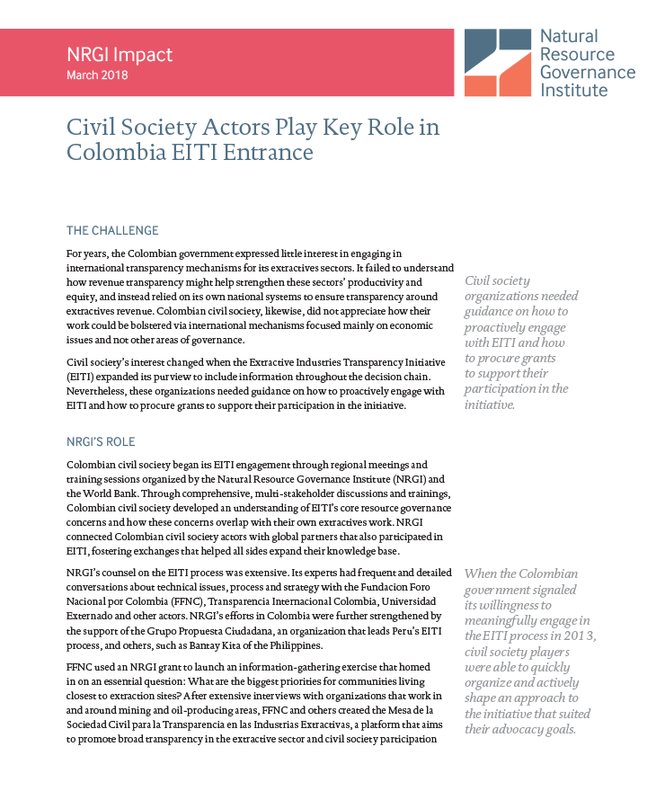 Through comprehensive, multi-stakeholder discussions and trainings, Colombian civil society developed an understanding of EITI’s core resource governance concerns and how these concerns overlap with their own extractives work. NRGI connected Colombian civil society actors with global partners that also participated in EITI, fostering exchanges that helped all sides expand their knowledge base. NRGI’s counsel on the EITI process was extensive. Its experts had frequent and detailed conversations about technical issues, process and strategy with the Fundacion Foro Nacional por Colombia (FFNC), Transparencia Internacional Colombia, Universidad Externado and other actors. NRGI’s efforts in Colombia were further strengthened by the support of the Grupo Propuesta Ciudadana, an organization that leads Peru’s EITI process, and others, such as Bantay Kita of the Philippines. FFNC used an NRGI grant to launch an information-gathering exercise that homed in on an essential question: What are the biggest priorities for communities living closest to extraction sites? After extensive interviews with organizations that work in and around mining and oil-producing areas, FFNC and others created the Mesa de la Sociedad Civil para la Transparencia en las Industrias Extractivas, a platform that aims to promote broad transparency in the extractive sector and civil society participation in the EITI multi-stakeholder group. The platform ensures that civil society is more comprehensively represented in the EITI process, and it is also used as a training tool for other issues related to extractive industries. One of Mesa’s focuses is the disclosure of social and environmental payments. One way that the platform increased transparency was by issuing a study that showed how environmental payments were rendered opaque by convoluted government processes. The study found that the regulation (and consequently the payments made by companies) linked to social and environmental issues was complex and the information diffused among the different areas; therefore, the low transparency of social and environmental payments was not a problem attributable only to companies. Although the disclosure of social and environmental payments has not yet been resolved in Colombia’s EITI reports, the research has helped clarify the problem that needs to be addressed. The NRGI-backed discussions and trainings bore fruit: when the Colombian government signaled its willingness to meaningfully engage in the EITI process in 2013, civil society was able to quickly organize and actively shape an approach to the initiative that suited their advocacy goals. Colombian civil society targeted the inclusion of environmental issues in the country’s EITI report and wide dissemination of the report to regional and national stakeholders. NRGI has helped to foster civil society and government interest in Colombia’s extractive challenges. It has laid the groundwork for civil society’s entrance into and constructive engagement with multilateral initiatives. NRGI’s guidance has also helped civil society actors to recognize and come to terms with the challenges it faces as part of EITI—these actors are learning how to manage expectations, as well as how to balance their demands with those of other EITI participants.